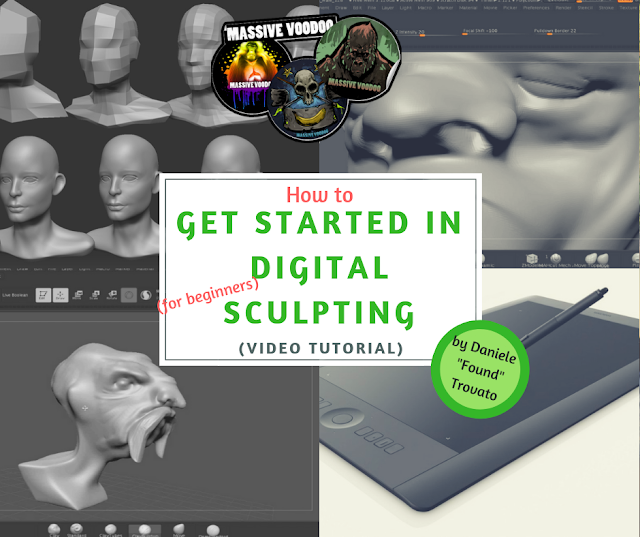 This article and video is designed to all who never have sculpted something in digital and would like to start doing it. I’ll explain you the basics of ZBrush and how to create your own sketch as a bust. Let’s start from the beginning: I am a traditional, non-digital sculptor. First of all, this is a personal consideration, let’s try to clarify: who is a sculptor? I’m sure that probably, I will raise a big sensation with my sentence, but it is only my opinion, nothing else. If you make a 3D sculpture, in my opinion, you are not a sculptor: you are a Digital Artist. Sculpting manually, or digital…it doesn’t matter: this is art! The proof of this is that many 3d sculptors can’t sculpt something traditionally. It doesn’t mean to diminish talent, nor is it a provocation. Very easy for beginners, you have “only” to learn the software to get started. If you’re not able to sculpt traditionally you’re not a sculptor (my personal opinion), you’re a Digital Artist. You can’t imagine the real sculpture finish until you print it! The User Interface and Brushes settings Let’s explore the basics of ZBrush UI . You’ll learn how to customize it in a faster way and what are the most important Brushes to sculpt something. Even if you don’t have the human anatomical knowledge, with 3D you can already get some good results. Many people think that 3D is more simple: this isn’t completely true! Otherwise, if a guy starts playing with the tablet and Zbrush, and creates something in 3D, just ask him “ok, buddy, now could you do the same with your hands?” 🙂 if the answer is no, it means that he is not a “complete” sculptor. In the last period somebody hired me to teach in a School for Digital Artists, because the school wants their students to have a traditional sculpture base: this is another proof of what i said and there’s no great satisfaction for me. If a 3D sculptor is not able to sculpt traditionally, it’s like a digital designer could not draw with a pencil. Is it plausible? If you have question, don’t hesitate to ask me, i will help you fast if i can.